In the era of the Premier League, the Champions League, the World Cup and live television broadcasts, it’s easy to forget what football really means to those of us in Hong Kong. There’s no shame in that. No one here really roots for China in international football—politics aside, China is as far from a footballing powerhouse as it can be, and its national football team is more likely to be an almighty embarrassment than any source of pride—and Hong Kong football just can’t compete on an international level. That the Hong Kong Football Association is constantly trying to find ways to drum up interest in the Hong Kong Premier League despite such fanatical following of European football week in, week out, is a damning reflection of the dominance of imported football content over “real” football. So to spend a couple of hours at the fundraising tournament for Hong Kong to send a team to the 2014 Homeless World Cup in Chile, hosted at the MacPherson Stadium in Mong Kok, was a welcome break and a reminder of the place football can, and does, have in our lives. The ubiquity of European football—the Premier League is the king of all leagues, due to the massive influence that Britain had over Hong Kong culture and daily life during its occupation until 1997—and footballing superstars have over football fans here is always interesting and mildly amusing. There aren’t many structured youth football programs here, probably because the fierce academic competition and rigorous education system here lends parents to send their kids off to after-school tutoring and other resume-strengthening activities rather than ferrying them to football training. So instead of any dribbling drills or passing practice, kids are out practicing free kicks and long shots in their own attempts to replicate what they see on their TV screens. So instead of any natural interest in pickup football on the streets leading to a fanatical following of TV football, it’s actually the other way round: It’s what we see on TV that compels us to play. Small wonder, then, that any game on the public concrete and asphalt fields usually features frequent breaks in play and generally peters out in intensity after 30 minutes: There’s no stamina or physical strength underneath the flashy tricks and occasional golazo attempts. I myself am guilty—a frequently-used, self-deprecating yet depressingly true description is that I’m a Steven Gerrard who plays with the intensity of Dimitar Berbatov. That in itself—the yearn to score blockbusters and take set pieces but not willing to do the dog work on the pitch (or, more accurately, not willing to put in the effort to gain the stamina to do so)—is more or less indicative of the general “attachment” to football here. Hong Kong commits itself to watching imported football rather than actually playing it. But it was the presence of another famous football name in town, and a revelation from a photographer that really hit home. 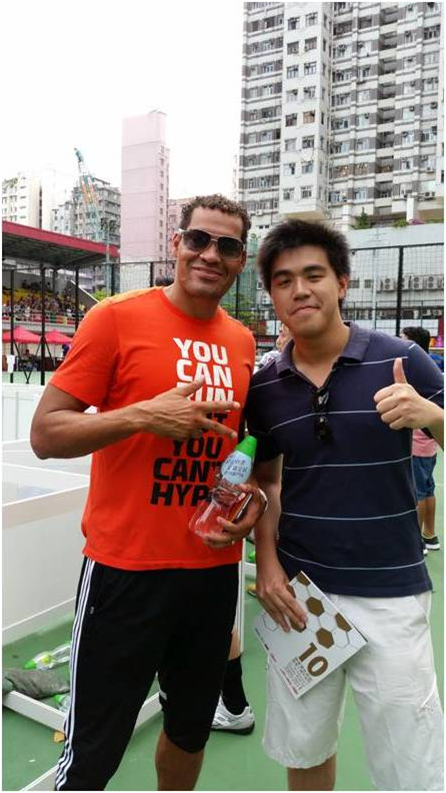 “Well, the goalkeeper is a compulsive gambler who just likes playing football.” The goalkeeper in question, of course, is the starting goalkeeper of the Hong Kong representative team that will travel to Chile for the Homeless World Cup. He’s a gambling addict, a “problematic” member of society. Founded by Mel Young from Scotland and Harald Schmied from Austria, the Homeless World Cup had its inaugural tournament in Graz, Austria in 2003, after the idea came about at a Cape Town conference on homelessness. Hong Kong first sent its own team two years later, courtesy of the fundraising and coordination efforts of the Society of Community Organization and Wofoo Social Enterprises of Hong Kong. The 2005 tournament saw Hong Kong send its first ever representative team to Edinburgh, after they managed to raise about HKD240,000 in funding, according to the official Homeless World Cup website. They finished 21st out of 27—just about in line with their professional counterparts. 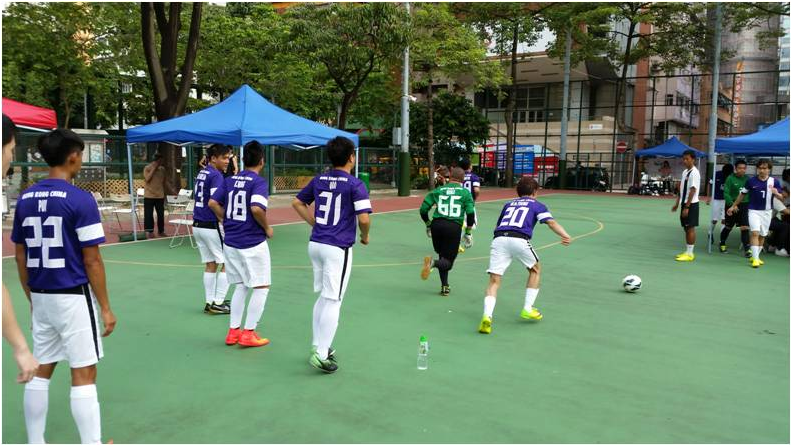 It was evident that both the organization and the cause have come a long way: A total of 24 teams, including those from such companies as A.S. Watson Group, Konica Minolta and Bubble Yum, paid HKD15,000 each to enter the fundraising tournament on Saturday. Many of the post-match write-ups about the fundraising event focused on Sunday instead—the event took place over the weekend at the same venue. Sunday was the more newsworthy date: Members of the Legislative Council, as well as a few celebrities, took part in an exhibition match, with controversial politician “Long Hair” Leung Kwok-hung featuring as one of the players. Carrie Lam, the Chief Secretary for Administration of the Hong Kong Government, gave a keynote speech highlighting the impact of homelessness in society. But that very occurrence belied the fact that homelessness was the issue at the crux of the event, for the media and the celebrities—barring Detinho and Mr. Lee—didn’t show up on Saturday, which was when the real action took place. Saturday was when the teams that actually paid a large sum of money took to the concrete fields and played 4-a-side. Saturday was when those 24 teams each had their own supporters—coworkers, friends et al—cheering them on the pitch, occasionally complaining and cursing (as football fans are wont to do). It was only on Sunday when, after the qualifying rounds on Saturday, the Hong Kong representative team actually won the fundraising tournament, the first time in the fundraiser’s 10-year history. The Hong Kong representative team warms up on the side of the mini pitches. Turns out you don’t actually have to be homeless to play on a Homeless World Cup team. This was where the subsequent coverage of the fundraiser in Hong Kong and the official Homeless World Cup website seem to differ slightly: A Wall Street Journal report said that participants qualified by having been homeless at some point in the last five years, while the official tournament website seems to emphasize the “homelessness” of participating players. In hindsight, choosing to go on the Saturday turned out to be the right decision. I didn’t return for the higher-profile Sunday, but in a strange way the lesser attention and commotion on site on Saturday meant that the focus was solely on the football and on the cause that the entire tournament supported. For a fundraising event for a charity tournament abroad, you’d think fashion and design would be one of the lowest priorities on the day. 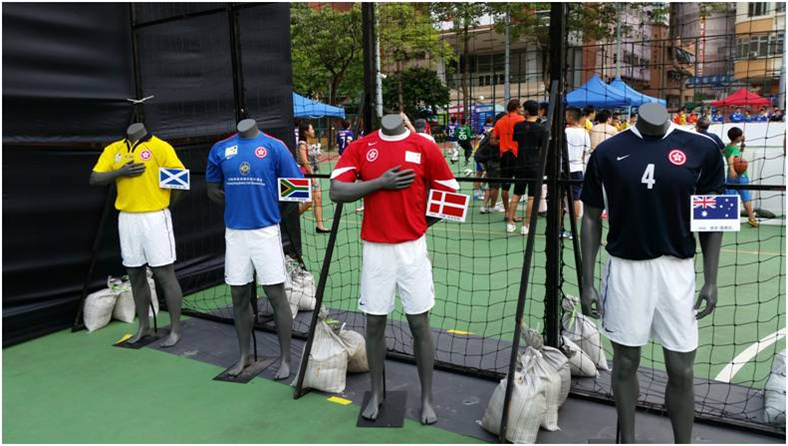 Yet taking center stage, sandwiched right between the two mini pitches, was a row of mannequins dressed in the Hong Kong team jerseys of years past—perhaps to commemorate the 10th anniversary of the Hong Kong representative team. After an hour or two onsite, I started to make my way back to the bustling streets of Mong Kok and head off to my next destination via the subway. Next door to MacPherson Stadium is a favorite hangout of local youths, where street dancers, band performances and middle-aged ladies dressed in bizarre costumes singing karaoke on the sidewalk share a pedestrian-only walkway. Right at the end of the street, there were two teenagers just beginning a football freestyle routine, complete with catchy electronic background music. I saw people come and go without much interest. It was the least-noticed and least-observed performance of the entire street. After 15 minutes, I had to get going. The skills on the street were all well and good, but the first game of the new Premier League was kicking off in a couple of hours. I had to eat first before I could sit down and watch my football.